It is not unusual for behavior problems to develop in older pets and often there may be multiple concurrent problems. Some of the changes associated with aging may not seem significant, but even a minor change in behavior might be indicative of underlying medical problems or a decline in cognitive function. Since early diagnosis and treatment can control or slow the progress of many disease conditions, be certain to advise your veterinarian if there is any change in your pet's behavior. Changes in the household, changes in the environment and new stressors can lead to problems regardless of age. For instance moving, a change in work schedule, a family member leaving the home, or new additions to the family such as a new spouse or baby can have a dramatic impact on the pet's behavior. However, older pets are often more resistant or less able to adapt to change. 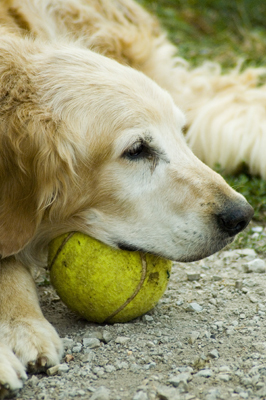 As pets age, they are susceptible to an increasing number of medical and degenerative problems. Problems with one or more organ systems may play a role in the development of a wide variety of behavior problems. For example, diabetes or diseases of the bladder, kidneys, liver or intestines can lead to house-soiling. Diseases of the endocrine organs such as the thyroid gland and pituitary gland can lead to a variety of behavioral and personality changes. A decline in the senses (hearing and sight), painful conditions, and those that affect mobility may cause the pet to be more irritable or more fearful of approach and handling (see our handout on the causes and diagnosis of behavior problems for more details). As with other organs, the brain is susceptible to age related degenerative processes that can affect the pet's behavior, personality, memory, and learning ability. When these changes occur, the pet may show varying degrees of cognitive and in pets that are more severely affected, this might be referred to as cognitive dysfunction or senility decline (see our handout on cognitive dysfunction). Many of these changes are similar to what occurs in aging humans. In fact, the amyloid deposits that are found in the brain of dogs with cognitive dysfunction are similar to what is seen in the early stages of Alzheimer's disease in people. How can I find out why my pet's behavior has changed? "Blood tests and a urinalysis may be needed to rule out organ disease and endocrine imbalances, especially in the older pet." Regardless of age, every behavior case should begin with a complete veterinary physical examination and a clinical and behavioral history. In addition, blood tests and a urinalysis may be needed to rule out organ disease and endocrine imbalances, especially in the older pet. Sometimes a more in-depth examination of a particular organ system may be indicated. Additional laboratory tests, radiographs, ultrasound, spinal tests, brain scans, or perhaps a referral to a specialist may all be appropriate. A decision on which tests are needed would be based on the pet's age, previous health problems, any ongoing drug or dietary therapy and an evaluation of all of its medical and behavioral signs and the findings of the physical exam. My pet is quite old. Is there any point in doing these tests? "Many pet owners ... feel that ... perhaps nothing can be done for their dog or cat." Unfortunately, many pet owners do not even discuss behavior changes with their veterinarians since they feel that the changes are a normal part of aging and perhaps nothing can be done for their dog or cat. This is far from the truth. Many problems have an underlying medical cause that can be treated or controlled with drugs, diet or perhaps surgery. Hormonal changes associated with an underactive or overactive thyroid gland, diabetes, diseases of the pituitary gland, and testicular tumors can all lead to dramatic changes in the pet's behavior and many of these problems can be treated or controlled. Degenerative organ systems can often be aided with nutritional supplementation or dietary changes. High blood pressure, cardiac disease and respiratory disease may be treatable with medication that can dramatically improve the quality and even length of the pet's life. Drugs and dietary therapy are also available that are useful in the treatment of age related cognitive dysfunction. For a more extensive list of health problems affecting behavior, see our handout on diagnosing behavioral problems. Some of the common things that should be reported should they develop in your pet include changes in behavior (see checklist below), an increase or decrease in appetite or drinking, an increased frequency or amount of urination, loss of urine control (dribbling urine, bedwetting), changes in stool consistency or frequency, skin and hair coat changes, lumps and bumps, mouth odor or bleeding gums, stiffness or soreness, excessive panting, coughing, changes in weight (increase or decrease), and tremors or shaking. The checklist on the next page can be used to determine if your pet has any changes that might need to be reported to your veterinarian. If any of these signs arise, they could indicate an underlying medical condition, a sign of stiffness or pain, a sign that your pet's senses are beginning to decline or a sign of cognitive dysfunction (see our separate handout on cognitive dysfunction). "...many of these signs are subtle in their early stages and may only be noticed in the home environment. " As mentioned, sometimes a change in behavior is the first sign of pain, illness or degenerative disease. However, the cause and significance of these signs cannot be determined unless they are reported to the veterinarian, since many of these signs are subtle in their early stages and may only be noticed in the home environment. Many of the problems of senior pets can be controlled or even resolved. Early detection and intervention with drugs, diets or supplements can control or greatly slow the progress of many disease conditions, improving the pet's quality of life and perhaps even longevity. 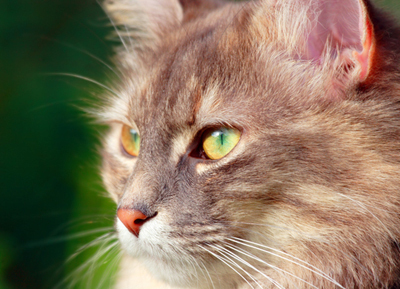 Specific treatments for cognitive dysfunction can be found in our handout on cognitive dysfunction in dogs and cats.